The ArduCAM module is not included as the board can be used for more that camera applications but the missing ESP is sloppiness on my part. I will check the BOM for consistency, thanks for pointing it out. 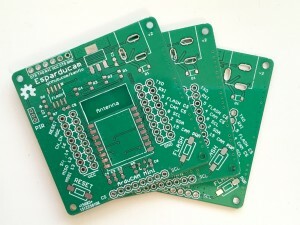 As for the availability of Esparducam boards, I will see what I can do. Cool. As I said on the AA project, I’d love to help from North America with a kickstarter or other similar “bulk” project if there’s interest. SMD parts are definitely out of my league. Johan, VERY interesting and THANK YOU for your effort and work. Clean product and wonderful presentation!! As @tedder – yup, me too. Boards look lovely (got mine in some sparkfun-esque red) and thanks for the great project platform, really looking forward to this weekend! how to connect arduino uno? and use code upload? the link to dirtypcb is not there. Could you provide this information ?